Richard Shireburn inherited the estate at Stonyhurst in 1537. He decided to do away with most of the medieval buildings to construct a bigger, grander hall. He held important posts in the county- at various times he was a magistrate, Member of Parliament, Master Forester of Bowland and Deputy Lord Lieutenant of Lancashire. He’d also been knighted for his part in fighting the Scots at Leith when he was 21. Despite all these positions of authority he was not trusted by the government of Queen Elizabeth I as he was from a Catholic family. Richard Shireburn could be seen as a ‘church papist’- that is someone who was Catholic but attended Protestant Anglican services. His wife was a ‘recusant’ meaning that she refused to attend church and so could be prosecuted. It was strongly suspected that Richard gave shelter to Catholic priests who would say mass for his wife. During her reign Elizabeth I introduced a whole raft of anti-Catholic legislation. No Catholic could hold public office or be a teacher, doctor or lawyer. All church services had to be Protestant Anglican, all clergy had to swear an Oath of Allegiance to the Church of England and anyone not attending church would be fined. Catholic priests were expelled from England and any found remaining would be killed, as could anyone giving them shelter. As the decades passed the Shireburns continued to fall foul of authority because of their faith. The third Richard Shireburn had the County Commissioners insist that he take the Oath of Allegiance or they would confiscate two thirds of his estate. His monument in Mitton Church’s Shireburn Chapel states that he was an ‘eminent sufferer’ for his loyalty to King Charles during the Civil War. He was forced to provide shelter for Oliver Cromwell and his troops on their way to the final conflict of the war, the Battle of Preston (1648). A fourth Richard Shireburn was imprisoned in Manchester gaol during the reign of King William of Orange, and died there. Better times began for the family when his son Nicholas married Catherine Charleton who brought with her a huge fortune to Stonyhurst. They used the money to further develop the house and gardens. Terraces, canals, fountains, lead statues and a yew wilderness were added, all in the latest Dutch style. However conflict re-emerged in 1715 when there was a Jacobite Rising to put James Stuart ‘the Old Pretender’ on the throne. Jacobite supporters from Preston went to Stonyhurst seeking Nicholas’s help. They left with guns, pistols and four horses for the second Battle of Preston. A contemporary family to the Shireburn’s with an even longer association with Lancashire are the Towneleys of Towneley Hall, Burnley. They too were persecuted Catholics and also took part in Jacobite plots (see here). When the Shireburns reached the end of their line the house and estate was passed by marriage to the Weld family. The Welds did not at live at Stonyhurst and for 40 years the house was left empty and began to become dilapidated. The owner Thomas Weld had three sons at the English Academy in France and decided to bring them back to England after the French Revolution. It was a turbulent time on the continent and the school had already moved first from St Omer, then to Bruges and was currently residing in Liege. The town authorities could no longer guarantee the safety of the boys and staff from the French Revolutionary troops, so Thomas invited the college to move to Stonyhurst. Many boys went home to see families in England first, but a small contingent of priests and pupils continued on to their new school. From this group the first boy to reach the hall was George Lambert Clifford. Work began in earnest to convert the stately home into a functioning school. The Long Room and Duke’s Room were split up into partitions to make small cubicles for the priests and boys. The lead statues from the gardens were melted down to use the metal to repair the roof. The medieval Duchess’s Rooms were destroyed using dynamite and the Great Drawing room was demolished. Thomas Weld seemed to be fine with all this dramatic reconstruction, and continued to gift more of the surrounding estate to the school. He maintained close links throughout the rest of his life, dying from a stroke at a school banquet after singing his favourite song. There are quite a few famous literary associations with Stonyhurst. The poet Gerard Manley Hopkins, a Jesuit priest, taught there. When Arthur Conan Doyle was a pupil at the college there were two Moriarty brothers and a Sherlock in attendance. In his novel The Hound of the Baskervilles he is thought to have based the look of Baskerville Hall with its ‘central block and twin towers’ on the front of the college and the Dark Walk in the gardens is the setting of Charles Baskerville’s dramatic meeting with the hound. During the second world war the English College in Rome was evacuated and came to Stonyhurst. J.R.R. Tolkien’s son John when studying to be a priest was evacuated from Rome to Stonyhurst, during the Second World War. Tolkien and the rest of his family often visited Stonyhurst to see him. He wrote some of The Lord of the Rings in the college and at its guest house, and was known to give the occasional lesson. Like many authors he would have used names and places that he came across as inspirations for his fiction. The list of vicars at Ribchester Church may have given him ideas for hobbit names see here. There is a Shire Lane in nearby Hurst Green (as well as the River Shirebourn). The River Loud is reminiscent of the book’s Loudwater. The ferry at Hacking Hall was still in use, which may have been the model for Buckleberry Ferry. There is also a claim that the vista from New Lodge gave rise to the inspiration for that of the view from Tom Bombadil’s house. The Tolkien connection continued when his son Michael taught classics at the college in the late 1960s to early 1970s. The college has always been at the forefront of innovation. 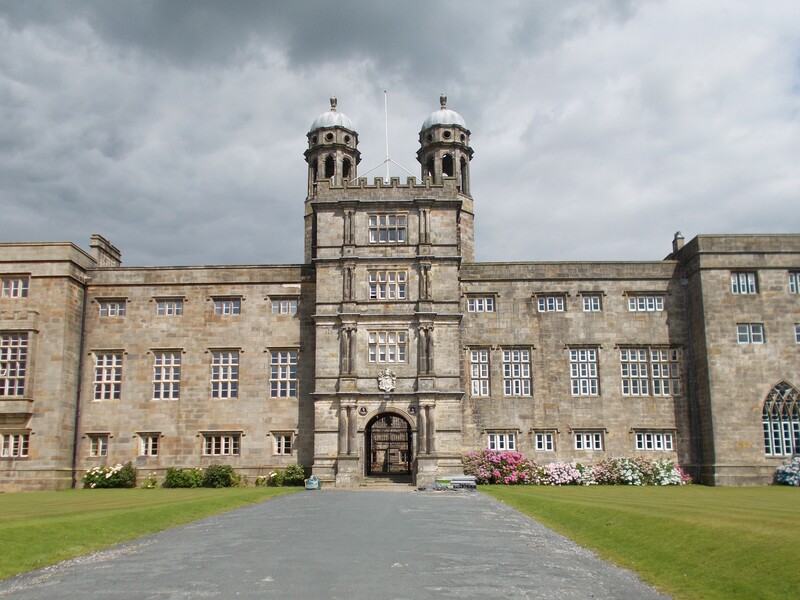 In the early 1800s Stonyhurst had the first school physics and chemistry labs in England. In the 1830s it had added the old observatory and weather station. Anti-Catholic legislation meant that believers were not allowed to study at university even as late as the 1840s. Stonyhurst entered into an arrangement with the University of London which was able to grant degrees to external candidates. These older students were Stonyhurst’s ‘Gentlemen Philosophers’ and were the first Catholics to gain a degree since the time of Elizabeth I. In 1811 Samuel Clegg built a gas works on site which supplied gas for lighting, previous to this the school had relied on weak tallow candles. His lime purifier removed hydrogen sulphide gas from the mix which is harmful to health. Later Stonyhurst became involved with the setting up of the Preston Gas Light Company and Preston was one of first towns to be lit by gas. Tradition is also a big part of the Stonyhurst heritage. Today the Lower Line girls wear exact copies of the tartan that Bonnie Prince Charlie (the Young Pretender) wore on his flight from Culloden. The college possesses one of three surviving fragments of the fabric. In 1997 one of the twin 300 year old stone eagles fell from its tower and smashed to pieces on the ground below. Copies were made of the original by John Schofield, master sculptor of Liverpool and the eagles were re-erected four years later. The gatehouse clock has also been restored and its chimes can be heard as far away as Hurst Green. The enigmatic handball walls are still in good condition and can be viewed in the college gardens (see picture above). Visitors taking the guided tour can see that although this is very much a working school, much of the oldest history has been preserved and is on show.